Hey everyone, how is life going? Do you wear specs?? I have been wearing spectacles from 5 years of age and that has somehow resulted in the severe dark circles I have around my eyes. And to be honest I have tried a few eye creams, but none of them showed any result. I have been using another eye cream, which I am reviewing today, for the past two months (not regularly, I skip it at times) and I have seen a little bit of effect. 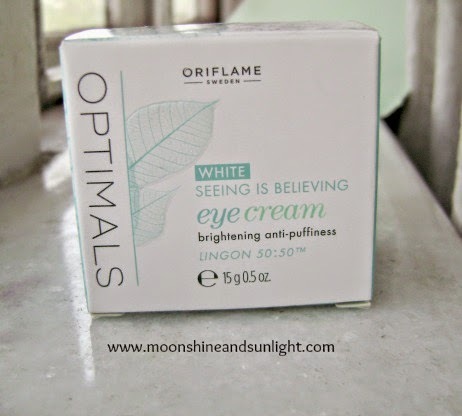 I am talking about Oriflame’s Optimals Seeing is believing eyecream. Let us see what I think about this product. Packaging: - The cream is in a transparent tub packaging with a light mint colored screw cap and comes in small white and light mint colored cardboard box. The shape is really interesting and the glass tub is tiny! But the amount present will go on for a very long time. Since it is a tub packaging, it is slightly un hygienic. But I like the fact that it comes in a aluminum covering. Product: - A sky blue-ish white cream which has a faint smell which is negligible and is thick in consistency. Spreads easily and evenly and is absorbed very quickly when you massage it around your eyes. Very little amount is required. My experience: - I have used it continuously for a long time and have seen a slight change in the areas around my eyes. But the biggest problem with this is that this irritates eyes sometimes and makes them water, burns a bit. Apart from that it is fine, but I would not buy this again after I have finished it, which will take ages! I would not recommend this eye cream due to the burning it causes. Do you use any eye cream regularly?? Want to suggest?? You can check out the review of all oriflame products on the blog here . yeah the burning is a downer ! I have recently started using this product and it has brightened my dark circles and helped smooth out fine lines. I am really amazed with its result. I love this product totally :) Great review dear! Well, I cannot comment about the fine lines but It has slightly lightened my dark circles. but the burning is scary !